AMES, Iowa – A new study from an Iowa State University biologist shows that menopause in mid-life is a uniquely human phenomenon among primates. The study, published in the Proceedings of the National Academy of Sciences, found that female representatives of other primate species remain fertile throughout their lifespan, while human women typically experience declining fertility and reproductive cessation during their 40s or 50s. The researchers compared long-term birth rates and death rates from seven different wild primate species with the !Kung, a population of hunter-gatherer humans in southern Africa who were selected for the study because of their limited access to modern birth control and medicine. For each species, they estimated the pace of reproductive decline as well as the pace of decline in overall health. The researchers found that for nonhuman primates, reproductive decline and overall health decline occur at the same rate. But reproductive decline occurs much faster for !Kung women. This means that nonhuman primates are able to reproduce much later into their lives than women. Female baboons, for example, have a lifespan of 25 years and remain fertile for virtually their entire adult lives. The study was the first to compare humans with multiple primate species living in the wild. The nonhuman primate data came from observations of monkeys, baboons, chimpanzees, gorillas and lemurs. Bronikowski said the debate over why women go through menopause, a question that has been studied for decades, remains unanswered. One suggested explanation is that mammalian eggs come with a shelf life that hasn’t kept pace with human life expectancy. According to this line of thinking, women are living longer, but their reproductive system hasn’t adapted to the change. Another idea is that menopause is an adaptation in humans that allows women to help look after grandchildren during their non-reproductive years. Proponents of this idea argue that humans gain an evolutionary edge with grandmothers helping to raise the next generation. Disentangling the cause and the consequences of the evolution of menopause is particularly tricky in current human populations where post-menopausal women are a standard demographic in the population, Bronikowski said. Testing how the presence of a living grandparent affects grandchild survival in non-human primates would be the next step in understanding why menopause has evolved in humans – and why not in other primates, she said. 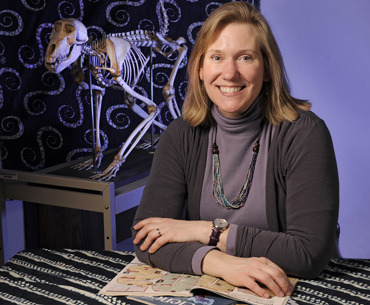 Bronikowski was part of a 10-member team of researchers composed primarily of primatologists who collected the birthrate and death rate data. Bronikowski was part of the team that analyzed the data and synthesized the results. A new study from an Iowa State University biologist shows that menopause in mid-life is a uniquely human phenomenon among primates. The study found that female representatives of other primate species remain fertile throughout their lifespan, while human women typically experience declining fertility and reproductive cessation during their 40s or 50s.